J. Harmes marked on the forward fifty line. The game was still young. With loose men ahead, “play-on” thought Harmes, but he didn’t. He stopped, he stood and he kicked straight for the Demons second goal. Two more soon followed and at quarter time Melbourne were up by a point. Thereafter they were never headed and romped home. It all started just prior to the Harmes goal when the Giants were up and Tom McDonald laid a splendid tackle on Phil Davis that the highlight reels omit. The Dees got going. Harmes was already well underway. Wearing number 4 and selected in the centre he played his best game yet for Melbourne. And, while he’s not an especially well known player he has the kind of authority and poise after 60-something games that shows why Melbourne may yet get there on 29 September. Beating the Giants at the MCG was a necessary part of that equation. It was a test of the September to come. The Giants have only ever won two games at the MCG – just two. I know this because my nine-year-old barracks for the Greater Canberra Region Giants and that is because Toby Greene, Jeremy Cameron, Nick Haynes, Jeremy Finlayson and Lachlan Keeffe amongst others have come over to Turner Primary School to talk to the kids, the girls and boys, who are now playing in numbers for Ainslie up the road – where Nathan Buckley and James Hird came from and where Cowboy Neale went because, among other things, he didn’t have to change his socks. My twelve year old has also switched to the Gees and she wants a beanie by next week. Round 23 pitted the oldest club of the “Grand Old Flag” against the youngest with the “Big Big Sound”. The MCG had an odd look on Sunday as the members were packed in cheek by jowl whilst in the general admission stands you could swing a herd of cats. Nevertheless the crowd of almost 38,000 could just about drown out that relentless bloke with the big big voice who fronts the Giants cheer squad. To his credit he doesn’t give up when the Giants are down and they were down at half time by just a couple of goals. 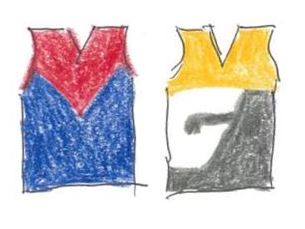 Melbourne wore a special guernsey for their faux anniversary game with a skinny red V on very dark navy blue. Stamped front and centre on the jumper was the number “160” to trace Melbourne to 1858 when Tom Wills put together a scratch game on the paddock that grew next to the MCG. There were just ten rules. Rule number 10 stated that under no circumstances was the ball to be thrown. It is now generally thrown under almost all circumstances so with two free kicks paid on Sunday for throwing the ball I suppose we should be grateful that tradition is honoured for more than marketing purposes. Anyway, the formal establishment of the Melbourne Football Club is given as May 1859 so look out for about Round 8 next year when yet another novelty guernsey will retail for $300. Strangely, but this will pass soon, GWS is the team that has played the fewest number of games against Melbourne = 11. Until Sunday they had won five each. The Brisbane Bears, the Gold Coast and even University have still played more games against the Dees than have the Gees. Herein, at the end of the Home and Away, lie two of the great dilemmas of following football. First, when your own team is gone, who do you go for? Do you want to cheer the oldest club with the longest Premiership drought or the youngest club in disproving the Australian Senate report of 2008 that said the Giants could not succeed because of “insurmoutable cultural barriers” in Sydney. A more personal dilemma arises nearby from the ones you love. In the third quarter, what do you feel when the Dees at the G are now taking the Giants apart? After half time my nine year old watches silently as the Demons swarm and even Callan Ward can’t make a difference – meanwhile my dearest friend in Hobart remembers 1964 as if it were only 54 years ago and also somehow maintains a fond if distant affection for Ray Biffin. So, here we are, two minutes into the third quarter Gawn kicks a goal whilst simultaneously playing as a Ruck, a Rover, a Ruckrover, and an extra Centre Half Back, then Petracca slots two on the trot, followed by Jones, and Neal-Bullen. Going goal for goal in the last quarter didn’t do much. The Gees are overrun and the Dees are overdue. (Go Dees!) When they win a flag that will leave St Kilda with the insurmountable curse of the most distant premiership. (Go Sainters!) Meanwhile the Giants are reclaiming Canberra for the national game that arrived in 1927 and then again in 2017 with the AFLW. But the Giants have lost back-to-back Prelims so – how long at what cost? The Bulldogs knew of that. Phil Davis, as stoic as they come, wept in the sheds after the September loss last year. My children barrack for them. (Go Gees!). My five and a half year old sings the whole club song, nearly. My twelve year old wears 31 for Ainslie but she now likes that odd number because she knows about Ron Barassi who was happily sitting in the members on Sunday smiling down from on high. She knows Scully wore 31 for the Demons and he was pick 1. My nine year old turns ten on Grand Final day. After the siren he said that he misses Tom Scully. The Giants do too.